As Christians, we are called to be both servants and warriors for Jesus Christ. The samurai, whose very title means “one who serves,” were skillful warriors of feudal Japan who devoted themselves fully to the service of their masters, willing even to sacrifice their lives in service to their lord. Christians are also called by their Lord, Jesus, to take up their cross and follow Him, and to seek to lose their life for His sake (Matthew 16:24-25). While fantastic legends and stories of the samurai are plentiful, The Way of the Christian Samurai draws from primary sources – notes, essays, and books written by real samurai from Japan’s feudal era. Their advice on everything from overcoming fear, giving counsel to others, serving one’s Lord, and self-sacrifice are remarkably applicable to the life of the modern Christian. 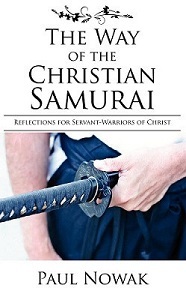 Author Paul Nowak ties the advice of these servant-warriors of old, pointing out how the selections from samurai texts relate to Christian teachings. The book is a matchless resource for Christians intrigued by the mythos of the samurai or Japanese culture, for Christian martial artists, or for pastors and other spiritual leaders who are looking for exciting anecdotes that illustrate Biblical ideals. Christian parents whose children enjoy Anime or Manga will find it a useful tool in understanding their children’s interests and in ministering to them. The following shirt designs are available from Eternal Revolution. Wear them with pride to your church functions or your dojo! 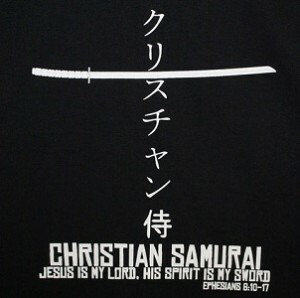 This design uses the kanji for Christian Samurai written vertically crossed by the katana, a samurai’s sword, to create a cross. The text reminds us that it is with the spirit of Christ our Lord that we wage spiritual war with evil. The samurai were told that their way of service was found in death, and living as though they were already dead. Christians are called to lose their life to find it, and to daily take up their cross. 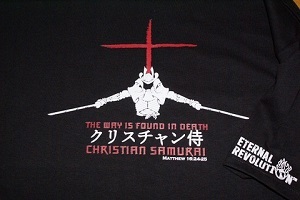 Features the kanji for Christian samurai written horizontally.